It's fair to say Kate has caught a little bit of baby fever ever since the subject was brought up at her and Rana's engagement party. Whilst Rana isn't exactly thrilled by the idea of having kids, it is something she has been prepared to think about given she just wants to make Kate happy. Unfortunately Rana's hesitation just isn't something Kate is picking up on at the moment and next weeks episodes see that dialed up yet another notch. On Monday Kate are Rana are left shocked to discover that the first round of IVF will cost £3,500, and when Rita mentions she wishes she'd had a child of her own it gets Johnny's mind going and he offers to pay for Kate and Rana to have the IUI treatment. That's something Kate is thrilled with but Rana is less enthusiastic. Wednesday's first episode sees Kate and Rana visit a fertility treatment and Kate is giddy with excitement, but that's not not something Rana can match despite her attempts to feign it. As talk turns to the technicalities of it all, Kate and Rana agree Kate will be the one to carry the baby and Kate can't wait to get pregnant. 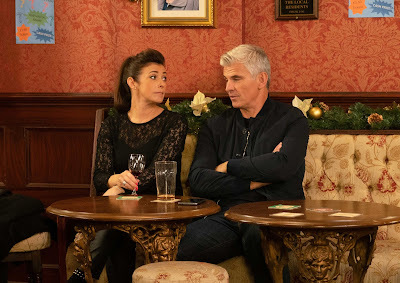 Kate is soon filling Johnny in on their trip to the clinic and Johnny's thrilled at the prospect of another grandchild, Rana masks her anxiety. However she does eventually bite the bullet and admit to Kate she's not happy with the idea of a complete stranger fathering their child, leaving Kate stunned. There has been speculation over whether Robert could act a the sperm donor instead, and Michelle does question him over whether kate's talk of babies is making him broody again but Robert covers and assures her he's over it. Friday's episode sees things begin to come to a head for Kate and Rana, as Kate bursts into the medical centre and suggests that they instead adopt a baby. Rana understandably is angry at being hijacked at work, and orders Kate to leave. Drowning her sorrows Kate then drunkenly suggests to Robert that he could father a baby for her and Rana. He tells Kate that her idea is crazy and sends her packing, but is that really the end of it or will he change his mind? You can watch all of this unfold on next week's episodes of Coronation Street, and be sure to check back in with us post episode for our thoughts.